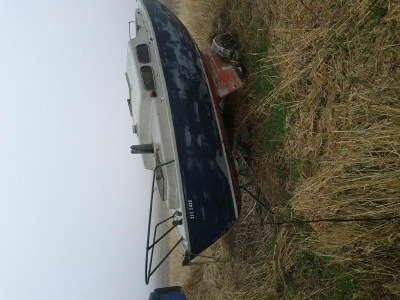 You may be wondering why the picture of the boat is sideways. Well, this is how it is posted on Kijiji. What does that tell you? The owner can’t even figure out how to rotate a picture? I can’t imagine what shape this boat is in! Here’s the link. It looks like a road trip for Captain Bligh and his trusty mate Glen in September! It looks like we may actually have bought this boat – it’s a “fixer-upper” and will look lovely in the empty space from the last fixer-upper – the ucky Lady (the L fell off and the name seemed appropriate). Today has been a very nice day. We did a lot of cleaning – inside and out – but were able to jump into the water when we got too warm from all that manual labour. I also did my cardio and yoga (not at the same time) and have been reading a really good book called A Sail of Two Idiots. These people knew nothing, absolutely nothing about sailing but bought a catamaran and actually made it to the Bahamas. The book is comprised of lessons instead of chapters and they made every mistake possible. Worthwhile to read. 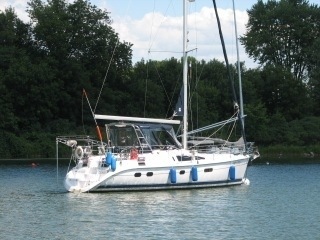 We are heading off to Kingston tomorrow and will be anchoring in the inner harbour. We will go to a marina on Wednesday – we couldn’t get accommodations for tomorrow as the marina requires 48 hours notice (sounds a bit odd). 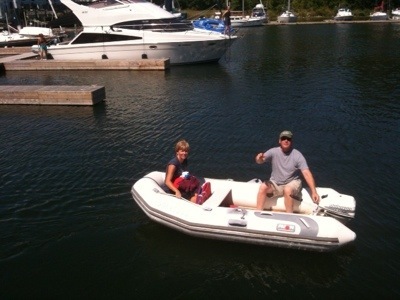 That’s ok – the anchorage is right outside the marina and they have a dinghy dock, so we will just row ashore. The other marinas are too far away from the downtown and this is what we want to see so it should be fun! That’s all I have to report today. Yesterday, there was a poker run at the marina (whatever that is) and a bunch of big “go fast” boats came in to get their cards. This is a picture of one of them. 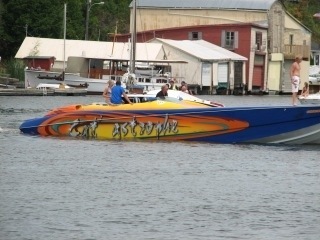 Interesting boats – very loud and VERY expensive. Quite impressive though. The Johnny Cash show was excellent and I would highly recommend it. The man’s name is Jim Yorfido and he and the band play the Johnny Cash gig all over the continent. He sounds very much like him and he played all of the hits. Another 420 Passage – this boat was even built in the same year! So, of course the couple who owned the boat spotted our boat and they came over and had the tour. Then, we went to their boat and toured their boat. Very interesting, similar yet different. Now, they have several things that I would like to have and have already started badgering the captain to get on it! First of all, they have companionway doors. Here is a link to the company’s website so that you’ll get an idea of what I am talking about. These doors would make life so much easier on the boat and they would keep out the bugs. In addition to this, when the air conditioning is on, we have to put in the hatch boards so when you want to go down into the cabin, you have to keep climbing over them. The companionway doors are so logical! The most interesting part of our conversation though, was we learned that George and Beth live on their boat from March 15th to November 15th. For the winter months, they housesit. They both work – George at the Pickering nuclear plant and Beth works at the Whitby marina. George put in a heating system for the colder months and also installed a central vacuum system! Very impressive! Right now, we are anchored out at Amherst Island and it is beautiful here. The water is excellent! We have gone swimming many times this afternoon and are enjoying the peace and quiet. 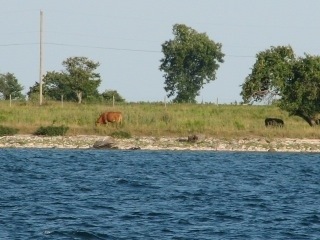 There were cows getting a drink earlier over on the island.